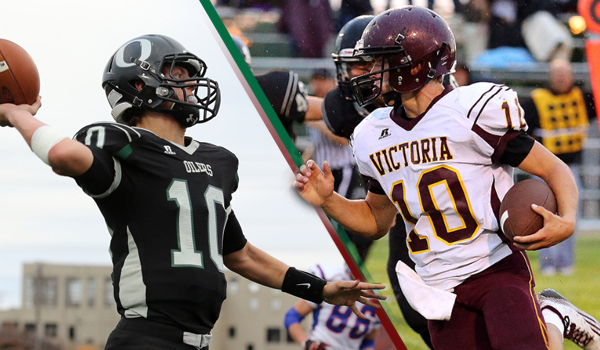 In Week 1, Central Plains and Victoria, a pair of ranked preseason teams, met in a high-profile Central Prairie League game in Claflin. Each squad was junior-laden; the Oilers had five seniors, while Victoria had two. Central Plains pulled away early in the fourth quarter for a 42-24 win. The Knights had problems with their passing game and senior end Noah Dreiling, a three-year starter, never had an offensive touch. Senior Bryan Dome had a long kickoff return and junior Brady Dinkel collected a pick-six. But Victoria was uncertain who would lead the team. In August, Central Plains was known more for its offense. It averaged 41.2 points and permitted 26.1 points combined from 2011-13. Junior quarterback Braeden Crites and senior wide receivers Layne Bieberle and Michael Lamatsch each had big games. Junior Jacob Warnken played his first contest at tailback after transferring from Hoisington. Sophomore Trey Schulte came into the game at guard and started the rest of the fall. The Oiler defense allowed just 177 yards on 50 plays – a sign of things to come. After Week 1 the teams went a combined 24-0 and each captured state championships on Saturday at Newton’s Fischer Field. The CPL became the first eight-man conference to sweep titles since the Twin Valley League with Baileyville B&B and Hanover in 2008. Behind Dinkel and Dreiling, Victoria passing game became elite, the Knights’ brand-new line (with no returning starters) dominated opponents, the defense/special teams scored nine touchdowns, and the team stayed healthy. Victoria rolled over Argonia-Attica, 52-8, for the Eight-Man, Division II title. Central Plains watched most of the blowout before it defeated Hanover, 42-30, in a game that wasn’t decided until the final 63 seconds. Bieberle, eight-man’s all-time leader in reception touchdowns, capped his career with a terrific performance, and Crites enjoyed another standout contest. Central Plains’ defense ranked No. 1 in Eight-Man, Division I all season and allowed just 10.1 points per outing. The CPL, also known for its longtime basketball success, has enjoyed plenty of great football in recent years. Ness City and Macksville have won crowns in the last seven falls. La Crosse (twice), Otis-Bison and Quivira Heights all have played in state titles in the last five years. This season, Ness City went 9-3 and reached sub-state before losing to Central Plains. The Eagles also fell in Week 4 to Victoria. La Crosse finished 9-2. This marked the first state football title in the fourth year of the consolidation between the tradition-laden Claflin and Quivira Heights programs. Victoria moved to 6-1 all-time in state championships, including eight-man titles in ’04, ’06 and a runner-up showing in ’08. Both teams stayed healthy, especially Victoria, which had massive injury losses the previous two seasons. The Knights emerged as the state favorite after regular season victories against Beloit St.
Dinkel passed for 1,052 yards and 20 scores and rushed for 976 yards and 19 TDs. Dome and Dreiling became great leaders and put up all-state seasons. Incredibly, the defensive line allowed 110 rushing yards on 100 carries in the final three playoff games. Victoria permitted 13.8 points per contest. While Victoria became the favorite, Central Plains always remained ranked, but generally behind Hanover, Osborne and Spearville. Then, the Oilers beat Spearville in the second round of the playoffs. In the state final, Central Plains was a 12-point underdog to Hanover, according to preppowerindex.com. But the Oilers – which trailed just one play in the postseason – continually forced Hanover to drive the field. In the final three playoff games, Spearville, Ness City and Hanover all ran more plays than Central Plains. The Oilers forced 10 turnovers in the three wins. While Victoria has enjoyed 13 straight postseason berths, Claflin went 1-8 when the Central Plains seniors were eighth graders. Then, Claflin and QH consolidated. The Oilers have went 9-2, 4-5, 9-2 and now 13-0. Bieberle capped it with an interception on the season’s final play.